The latest news from Apple Academic Press. Look here for updates on books and journals that are hitting the presses. This book series is planned to have nine volumes on high-level research and information on medicinal chemistry. The books will have interdisciplinary appeal and will be of value in the fields of pharmacology, biopharmaceuticals, computational chemistry, medicinal chemistry, molecular biology, and other fields. Books in this series are intended to be high-level reference books, designed for industry professionals, academics, and researchers as well as for postgraduate and doctoral students in the interdisciplinary field of advanced medicinal chemistry. The editors of the individual volumes have extensive experience in their fields. OMICS Group proudly invites all the participants across the globe to its premier International Conference and Expo on Biomechanics and Artificial Implant Design, Jul 27-29, 2015, Florida, USA. Theme of Biomechanics -2015 is “Novel approaches in biomechanics and innovative methods in implant designing”. Biomechanics-2015 is the premier event which brings together a unique and International mix of experts, researchers and decision makers both from academia and Industry across the globe to discuss the current issues and to share the research idea in the arena of biotechnology, biomechanics, pharmaceutical science, medical science, life science and other allied fields. The event includes interactive sessions, Key note speech, of Oral Presentation, Poster presentation, Scientific partnering, Exhibition etc. Apple Academic Press has been receiving great feedback. Here is a review on working with AAP from Dr. Benjaram M Reddy, a versatile chemist with varied experience in catalysis, physical chemistry, organic chemistry, and materials science with special expertise in the areas of nanomaterials and green technologies. He is the editor on the AAP title Industrial Catalysis and Separations: Innovations for Process Intensification. Dr. B. M. Reddy has more than 230 research publications (h-index 38) in high quality international and national journals and holds 8 patents to his credit. His papers have been cited more than 4800 times. As we know, preserving the quality of fresh produce has long been a challenging task. In the past, several approaches were in use for the postharvest management of fresh produce, but due to continuous advancement in technology, the increased health consciousness of consumers, and environmental concerns, these approaches have been modified and enhanced to address these issues and concerns. The Postharvest Biology and Technology series will consist of edited books that address several aspects related to postharvest technology of fresh produce. The series will present existing and novel management systems that are in use today or that have great potential to maintain the postharvest quality of fresh produce in terms of microbiological safety, nutrition, and sensory quality. The books are aimed at professionals, postharvest scientists, academicians researching postharvest problems, and graduate-level students. This series is intended to be a comprehensive venture that provides up-to-date scientific and technical information focusing on postharvest management for fresh produce. • Postharvest operations such as sorting, grading,ripening, de-greening, curing etc. We are seeking editors to edit volumes in different postharvest areas for the series. Interested editors may also propose other relevant subjects within their field of expertise, which may not be mentioned in the list above. We can only publish a limited number of volumes each year, so if you are interested, please email your proposal wasim@appleacademicpress.com at your earliest convenience. Caitlin Gillian, one of the editors the on the title Research for the Radiation Therapist, shared her thoughts on working with Apple Academic Press. Research for the Radiation Therapist provides a tangible resource for radiation therapists around the country, and even internationally, to aid them in their research and academic pursuits, helping them to navigate the unfamiliar world of research. Dr. Mahmood A. Khan's classic is in production for a third edition. And we're getting great feedback! "The newly revised 3rd edition is a classic book covering one of the most vibrant and vital sectors of the US economy. . . . 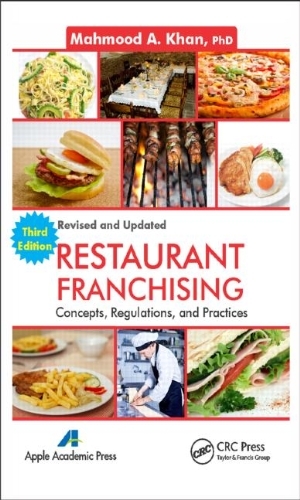 The book is an excellent introduction, much more than a general academic treatment of the topic. . . . On behalf of the International Franchise Association, we are grateful to Dr. Khan for revising and bringing out a new edition of this classic book. It is a multi-purpose book, serving as classroom textbook, reference book, and business guidebook. We are delighted to recommend it on the menu for anyone who wants to learn more about this fascinating, fast-paced, and dynamic industry." Interested in a examination copy for classroom adoption? Email us at mail@appleacdemicpress.com. Just let us know your name, title, university address, and phone number. Also, please provide the course title, current text in use, and the enrollment per semester. The editor of a forthcoming book on “Bioenergy: Opportunities and Challenges” is pleased to invite you and members of your research group to submit an article/chapter for this book, to be published by Apple Academic Press, USA. Proposals related to the economics of any bioenergy systems, demand/market for bioenergy systems, reactor designs, etc., are also most welcome. Authors interested in this theme may submit a short proposal of their article by email: rnkrishnaraj.nit@gmail.com on or before June 10, 2014. The deadline for manuscript submission is the August 15, 2014. Apple Academic Press is pleased to announce several new series of AAP Research Notes. These series will publish several volumes each year. The AAP Research Notes series publish new research development in different fields of science for academic institutes and industrial sectors interested in advanced research. The main objective of the AAP Research Notes series is to report research progress in modern science and complex technology for scientists in a technological society. The series publish new developments in all areas of science and technology quickly, informally, and at a high level. Summer 2016 News, Announcements, and Updates! Discussion with Ralph Hermansen on the New Title "Polymeric Thermosetting Compounds"
© 2014 Apple Academic Press, Inc. Picture Window theme. Powered by Blogger.